The staff at the Community Foundation of Lorain County recently mailed distribution checks to the following historic, anchor and beloved Lorain County institutions: Lorain County Historical Society, Black River Audubon Society, Lorain County Community College, Oberlin College, and Elyria Memorial Hospital Foundation. This sustainable support was made possible through the generous estate donation of John F. Smith, "Jack" as we all knew him. A 1944 graduate of Elyria High, Jack went on to Oberlin College where he majored in Chemistry/Zoology and then went on to serve the U.S. Army during the Korean War. Upon arriving home from the war, he joined the family business, Pierre R. Smith & Co. Inc., an Elyria based investment firm. Jack loved life, nature and gardening and was known for his award winning dahlias. Jack spent his entire life giving his support, resources and knowledge to organizations he believed in. A Rotarian and Paul Harris Fellow with District 6600, Club 3473 since 1957, Jack co-founded Black River Audubon Society in 1958. Some of his most beloved projects included Audubon Adventures, which educated children on the beauty and importance of wildlife, ecology, and conservation and the Bluebird Trail Program, where he would organize a group of volunteers to build Bluebird boxes. Jack and his band of merry men and women built over 500 Bluebird boxes in the history of the program. He was also past-President of Audubon Ohio; member of the Ohio Mushroom Society and the Lorain County Beekeepers Association. Jack was a life-time member of Black Swamp Bird Observatory; National Audubon Society; the American Legion and Veterans of Foreign Wars. 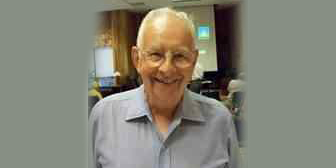 He was a Trustee Emeritus for the Lorain County Historical Society; Board Member and Advisor for Western Reserve Land Conservancy since 2000; served on the Investment Committee for Elyria Memorial Hospital and Oberlin College Alumni Association. In his obituary a friend was quoted as having said, "Most of us come into this life and make a difference in the lives of a small few, but Jack definitely left this world better for many!"